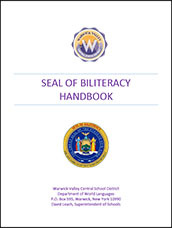 Chapter 271 of the Laws of 2012 added a new Education Law §815, effective September 2012, to establish the New York State Seal of Biliteracy (NYSSB) to recognize New York State high school graduates who demonstrate academic excellence in attaining proficiency in one or more languages other than English with a state seal of biliteracy. This new law made New York the second state to implement a Seal of Biliteracy program, following California. In January of 2014, some districts and pilot schools in New York State were asked to pilot the implementation, criteria, and process to be used by all state schools in awarding the Bilingual/Biliteracy Seal to our students. The Seal of Biliteracy pilot program afforded districts and individual schools an opportunity to develop innovative ways of measuring and creating an approved path to attaining the Seal of Biliteracy, inform statewide policy development, and share best practices. The intent of the NYSSB is to encourage the study of languages; identify high school graduates with language and biliteracy skills for employers; provide universities with additional information about applicants seeking admission; prepare students with twenty-first century skills; recognize the value of foreign and native language instruction in schools; and affirm the value of diversity in a mutilingual society. the Board of Regents and attend schools in districts that voluntarily agree to participate in the program. The participating students must achieve a proficiency level of Intermediate High, based on the American Council on the Teaching of Foreign Languages (ACTFL) scale. The seal will be attached to diplomas and transcripts of graduates who have attained Seal criteria at no cost. Testing accommodations recommended in an individualized education program or section 504 Accommodations Plan must be provided for all State and districtwide assessments administered to students with disabilities, as consistent with State policy. Students with disabilities should also receive these testing accommodations on Checkpoint C World Language Assessments, as permitted. *Students in schools with an alternate pathway for graduation approved by the Commissioner will be held to those schools’ criteria. You will research, explore and choose a selected and approved topic through multiple genres in the target language. You will then be required to select 2 genres (one from listening and speaking and one from reading and writing) from the genre list below that will guide you throughout the development of the project. A multi-genre project is personal, creative, and cannot be copied from another source. You will be making conscious decisions about what information or ideas are important and how this information or these ideas should be presented. The purpose of this project is to highlight your research, writing, and speaking skills in the target language. As you research and create, you need to consider your topic and think about what genres will be effective to communicate your ideas and impressions. Your choices must be intentional and have a purpose. All project assignments are due the date of the Showcase. Video blog: Create a 2-4 minute video blog about your selected topic. 4 – Exceptional: Checkpoint sheet completed and signed by your sponsor, including a project proposal. 3 – Proficient: Checkpoint sheet completed but aspects turned in late or select items missing. 2 – Developing: Checkpoint sheet completed haphazardly and/or aspects turned in very late and elements missing. 1 – Novice: Checkpoint sheet not completed. 4 – Exceptional: Accomplishes the task; includes 2 genres that are clearly connected to the development of the project task, but there may be minor irrelevancies. 3 – Proficient: Accomplishes the task; includes 2 genres that are generally connected to the development of the project task, but there are some irrelevancies. 2 – Developing: Accomplishes the task; includes genres, some of which may be only loosely connected to the project task. There are many irrelevancies. 1 – Novice: Attempts to accomplish the task; includes genre(s) but provides limited to no connections to the project task. Pronunciation or written errors do not hinder overall comprehensibility of the final product. Pronunciation or written errors may hinder overall comprehensibility of the final product. Pronunciation or written errors do hinder overall comprehensibility of the final project. The New York State Seal of Biliteracy was implemented to recognize high school graduates who have attained a high level of proficiency in listening, speaking, reading, and writing in one or more languages, in addition to English. If you are interested in attaining the WVCSD NYSSB, follow the directions on this page to complete the required tasks for this recognition. Return the completed NYSSB student application (only Part A is necessary) and NYSSB Statement of Intent form by February 1st of senior year to school guidance counselor. Request to have copies for your records. Meet with your ELA or ENL sponsor to draft an ELA NYSSB timeline based on the requirements. Schedule quarterly meeting dates with each sponsor to monitor your progress and adherence to timeline deadlines. Check in with the school guidance counselor regularly to update completed requirements, when applicable. At the completion of all requirements, meet with the school guidance counselor to attain a copy of the NYSSB student application; Part A and Part B must be completed by June 1st of senior year. Agree to sponsor a NYSSBA candidate by signing off on the sponsor section of the WVCSD NYSSD student application. Keep a completed copy for your records. Meet with the school guidance counselor to attain the WVCSD NYSSB Handbook and verify student application status. Review the WVCSD NYSSB requirements for English or World Language with the student, and assist student to complete an ELA or World Language timeline. Schedule quarterly meeting dates with the student to monitor student progress and adherence to timeline deadlines. Verify student exam scores with school guidance counselor to determine completion of each NYSSB requirements, when applicable. Meet with the school guidance counselor to verify that Part B of the student application is complete. Keep a copy for your records. Distribute the WVCSD NYSSB student application and the WVCSD NYSSB Agreement/Statement of Intent form to interested candidates in order to meet the deadline for submission for the student’s senior year. File submitted WVCSD NYSSB student application and NYSSB Agreement/Statement of Intent form. Make a copy for student’s records. Meet with student regularly to update completed requirements, when applicable. At the completion of each requirement, complete the appropriate section of Part B of the NYSSB student application: check box, initial, and date of completion. Meet with student to verify completion of all required assignments; both Part A and Part B must be completed and filed in the student’s folder by June 1st of senior year. Read the WVCSD NYSSB Handbook and become familiar with the requirements. Submit an application (Part A) and Letter of Intent form to school guidance department by February 1 of senior year. Meet regularly with the school guidance counselor to verify progress towards NYSSB requirements. Meet regularly with sponsors by following the NYSSB Checklist and begin journal entries. Identify and schedule all required language assessments by March 30 of senior year. Multi-genre project option: Submit all assignment by April 1. Complete all language assessments by June 1 of senior year. Final meeting: check in with guidance counselor to complete Part B of NYSSB application by June 1. Graduate high school with Seal of Biliteracy on diploma; indicate this distinction on résumé and college applications. **If you have any difficulty accessing the above documents, please contact James Yap, Assistant Superintendent for Curriculum & Instructional Services, for an alternative version.